As summer drifts into fall, certain telltale signs of the approaching Mid-Autumn Festival (中秋节, Zhōngqiū jié) begin to appear all over China. Classmates and coworkers start to ask each other if they plan to visit family over the holiday. You’ll start to hear familiar songs like “但愿人长久 (If Only We’ll Live Forever)” and “月亮代表我的心 (The Moon Represents My Heart)” played in stores. Best of all, supermarket shelves start to fill up with mooncakes! You might already know about the moon goddess Chang’e and the origin of the Mid-Autumn Festival from Tales and Traditions. Today, at its heart, the Mid-Autumn Festival is still about family togetherness. Loved ones gather together to gaze at the moon and share mooncakes, a traditional pastry whose round shape represents unity. 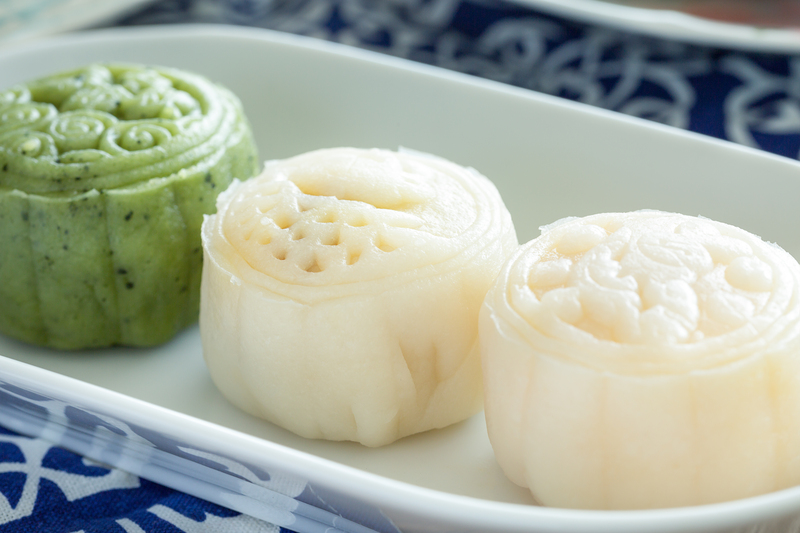 For those who can’t go home for the holiday, mooncakes can also be a taste of home, as there are many distinct regional styles. Of course, as China has changed rapidly over the last few decades, these traditional pastries have been given a contemporary facelift. Not only are different regional styles of mooncakes available all across China, but big international companies like Starbucks and Haagen-Dazs have started selling their own mooncakes. But before you rush out to the nearest Chinese bakery, we’ve prepared a handy guide to these pastries below. Though Chinese pastries tend to be less sweet (甜, tián) than Western pastries, sweet mooncakes are still a popular choice. Traditional flavors include red bean paste (红豆沙, hóngdòu shā), lotus paste (莲蓉, lián róng), jujube paste (枣泥, zǎoní), and five-nut (五仁, wǔ rén). However, less traditional fruit flavors like strawberry (草莓, cǎoméi), melon (哈密瓜,hāmìguā), and mango (芒果, mángguǒ) are also growing in popularity. You can even find chocolate (巧克力, qiǎokèlì) and ice cream (冰淇凌, bīngqílíng) mooncakes on supermarket shelves. One of the most iconic mooncake ingredients, the salted duck egg (咸鸭蛋, xián yādàn), never appears as a standalone filling. The round, yellow egg yolk (蛋黄, dànhuáng) represents the harvest moon, and some special mooncakes may contain more than one egg yolk! Salted duck eggs are often paired with sweet fillings, but the flavor of the egg is so strong that these mooncakes taste salty (咸, xián). Nǐ xǐhuān tián de háishì xián de? Do you like sweet or salty? Egg yolk mooncakes are too salty. I don’t like to eat them very much. Hóngdòu shā yuèbǐng hěn tián, nǐ chī yī kuài ba! Red bean paste mooncakes are sweet. Have a slice! If you’re a vegetarian, make sure to keep an eye on the ingredients list--many mooncakes are made with meat (肉, ròu) filling! 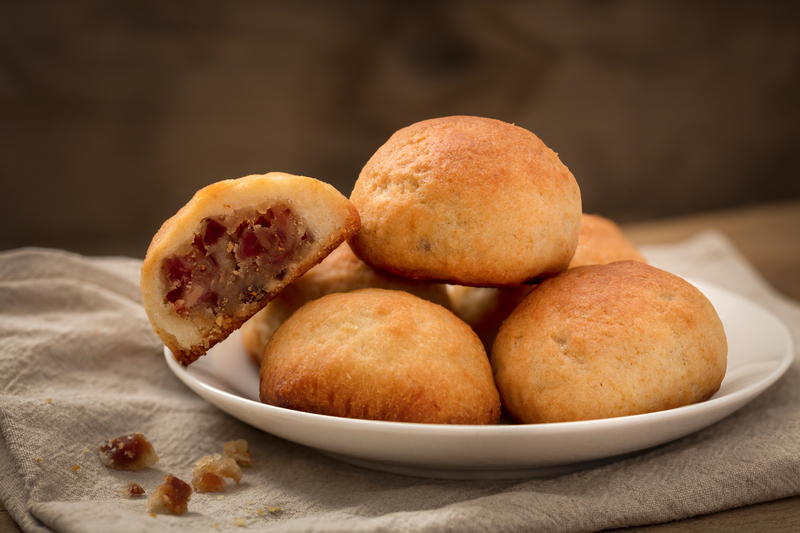 The most famous meat-filled mooncakes (鲜肉月饼, xiān ròu yuèbǐng) come from Suzhou, and feature a flaky crust and a minced pork filling. The taste is more like dumplings or dim sum than cake. Typically, meat-filled mooncakes are found only in bakeries, because they are harder to prepackage and keep fresh. Wǒ bù chī ròu. Yǒu sù de ma? I don’t eat meat. Is there anything vegetarian? 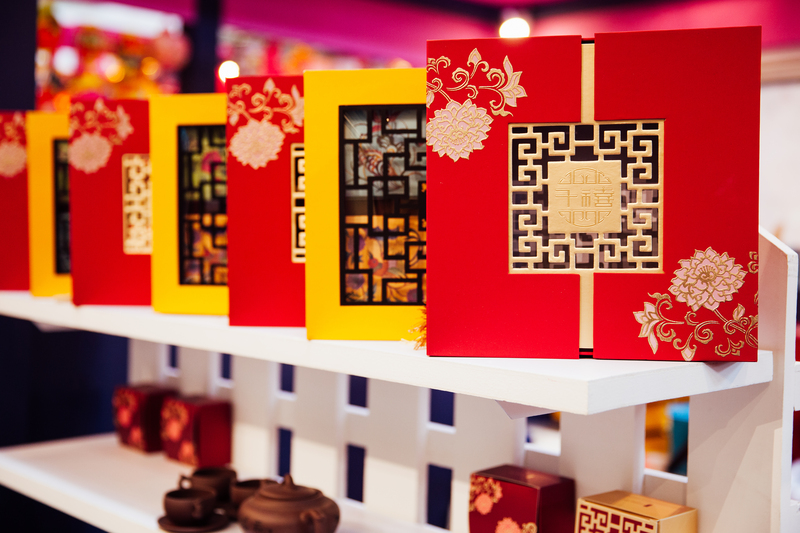 It’s customary to exchange mooncakes with family and friends during the Mid-Autumn Festival. Mooncakes are also commonly gifted to people you want to impress--a business person, for example, might send expensive (贵, guì) mooncakes to a new client. As a matter of fact, the practice of using lavish box sets of mooncakes to curry favor with officials, bosses, and teachers became such a problem in China that in 2014 the government had to ban the purchase of mooncakes with public funds. Zhège yuèbǐng duōshǎo qián? Wǒ bùxiǎng mǎi tài guì de. How much is this mooncake？ I don’t want anything too expensive. Zhè hé yuèbǐng duōshǎo qián? Wǒ shì gěi biérén mǎi lǐwù, suǒyǐ bùxiǎng mǎi tài piányi de. How much is this box of mooncakes? I am buying a gift for someone else, so I don’t want anything too inexpensive. Tiān a! Zhèxiē yuèbǐng zhēn guì! Goodness, these mooncakes are really expensive! Mooncakes are not only delicious, but they’re also beautiful (漂亮, piàoliang). 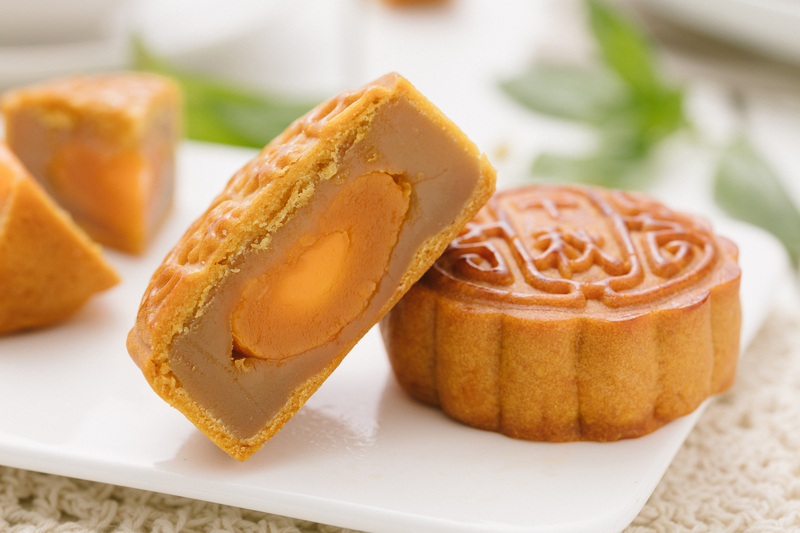 The classic Cantonese-style mooncake features a soft golden-brown crust printed with ornate decorations. Hong Kong-style “snow-skin” (冰皮, bīng pí or 雪皮, xuě pí) mooncakes are also very attractive because of their snow-white exterior that resembles Japanese mochi. Zhège yuèbǐng tài piàoliang le, wǒ doū bùxiǎng chīle. This mooncake is so pretty I don’t want to eat it.